and the people who care for them. The overall mission of Wallace the Pit Bull Foundation is to improve the lives of dogs and the people who care for them. Wallace not only paved the way for dogs that look like him, but he was an inspiration to millions across the globe, and represents shelter dogs everywhere! Now that he has passed on, we want to preserve and promote his story, promote adoption, and support other dogs and people that make a positive impact within their communities. Our goal is to improve the human canine bond, regardless of the dog’s breed because we feel a good dog is a good dog. It doesn’t matter what they happen to look like or where they happen to come from. The founders of Wallace the Pit Bull Foundation, Roo and Clara Yori, have been involved with rescue dogs since 2002. They’ve done everything from working in shelters to sitting down with leaders of major organizations. Their work has been featured in media around the world, and they continue to utilize the knowledge they’ve gathered to further help dogs in need. You can rest assured that your donations will go to good programs that are backed by good people making a significant impact for dogs in their care. Wallace the Pit Bull Foundation is a 501c3 organization, and all your donations are tax deductible to the extent of the law. Have you read the story that got it all started? If not, you’re missing out! 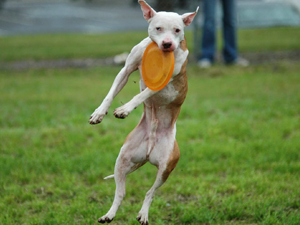 Wallace’s rise from unwanted shelter dog to flying disc champion will inspire anyone who flips through the pages! For a $20 donation through the link below, we’ll send you a “Pawtographed” copy that you can only get through Wallace the Pit Bull Foundation! Limited quantity, so get your copy today! Makes a great gift! Wallace was a shelter dog turned disc champion. He was targeted for euthanasia, but shortly after Wallace went into foster care it was discovered that he really liked to catch Frisbees. In his second year in the sport, Wallace won the 2006 Cynosport World Games, and the next year he won the 2007 Purina Pro Plan Incredible Dog Challenge National Championship for flying disc, changing minds one disc at a time. He traveled the country competing and showing off his athletic abilities, proving that he deserved the chance he was given. In his retirement, he was diagnosed with hemangiosarcoma and transitional cell carcinoma, two aggressive cancers. He far surpassed the predicted life expectancy, and his fans enjoyed the extra time he was given while he worked his way through his bucket list of adventures. Wallace got to ride in a motorcycle sidecar, wade in the ocean, play fetch through the mail with MLB pitcher Mark Buehrle, and even meet Betty White! Wallace’s body is no longer with us, but his spirit and legacy live on. We look forward to helping many more dogs in his honor! Read Wallace’s full story in the book “Wallace – The Underdog Who Conquered a Sport, Saved a Marriage, and Championed Pit Bulls – One Flying Disc at a Time”. For pawtographed copies, visit our store! All proceeds benefit Wallace the Pit Bull Foundation. Hector was one of the 51 pit bulls rescued from the Michael Vick dog fighting case. He was part of the group that went to BAD RAP out on the west coast. Initially he went to see about being a detection dog, but that wasn’t for him. Hector bounced around between many fosters, which was cool with him since he got to see that many more things. Eventually, he ended up getting adopted by a couple in Minnesota. He enjoyed his new life hanging out with doggie pals Angus, Mindy Lou, and Scooby Snack. Hector passed the Canine Good Citizen test twice, and became a Certified Therapy Dog to visit nursing homes and hospitals. He also went to schools to help teach kids how to act safely around dogs. Once “retired”, Hector enjoyed his days going for walks,sunning himself in the yard , and eating grass. Hector was cool with everybody, even though he was treated badly in his younger life . After the couple of bad years with Vick and his buddies, he enjoyed 7 years of love and fun adventures. Unfortunately his past life caught up with him, and he began having health struggles at age 8. His body succombed to cancer on 10/27/2014 at the age of nine, and leaves a legacy of helping other dogs in similar situations get the chance they deserve as well!